Police and Wells Fargo bank dispute several details of Sam Benson's account of this incident. Click here for more. ATLANTA – A rapper said that police stopped him outside of an Atlanta bank on Friday. Sam Benson, who goes by the name “Blac Youngsta,” said it all began when he stopped by a Wells Fargo bank on Peachtree Rd. NE. ATLANTA -- Atlanta's tallest building has new owners following the purchase by a San Francisco-based company. The purchaser, privately-owned Shorenstein Properties LLC, announced the acquisition of Bank of America Plaza on Tuesday for an undisclosed price. At 55-stories and 1.3 million square feet, the building has been a staple of the Atlanta skyline since 1992. But as the Atlanta Business Chronicle reports, it has been both a symbol of the commercial real estate boom - and the eventual bust. The building went back to its lender amid the commercial real estate crash and since it's opening, many of its tenants have downsized or relocated. ATLANTA -- The life of legendary Atlanta concert promoter Alex Cooley will be celebrated Saturday night in Atlanta. Cooley, a longtime fixture in the local and national music scene, passed away Dec. 1. He was 74. The tribute will be held at the Tabernacle from 7 p.m. to 9 p.m. It will feature performances and tributes from Blackberry Smoke, Drivin N Cryin, Kristian Bush (of Sugarland) and more acts. The event is free, but a ticket is required. Tickets are available on a first-come, first-served basis through Ticketmaster. Click here for more. ATLANTA (WXIA) -- There are two fewer trees at the state Capitol building in 2016 – after crews spent the New Years weekend taking down two old oaks. An arborist told state officials the trees were likely to fall and hurt people. The trees came down after the Georgia Building Authority,issued a 57-page report on the health of the two oaks. Workers used a 38 ton crane to take down the trees piece by piece over the weekend. The work came after a painstaking analysis of the health of the two oaks – which had shaded the statue of Joseph Brown on the southwest lawn. A scarlet oak had heartwood decay 36 inches deep, as measured by a tape. The report said the "likelihood of failure is 'Probable'" on both trees. ATLANTA -- An apparent random gunshot has left a man unconscious - and not breathing - in downtown Atlanta, police told 11Alive Thursday night. The victim was found shot in the chest in a pickup truck at Cone and Walton streets around 11 p.m. just blocks from the New Years Eve festivities also happening in the city. Despite the injuries, Atlanta Police Department spokesperson Elizabeth Espy said the victim was transported to Grady Medical Center and is stable. Investigators are working to provide a followup condition and canvassing the crime scene for witnesses. Officers in the same lot heard no gunfire. 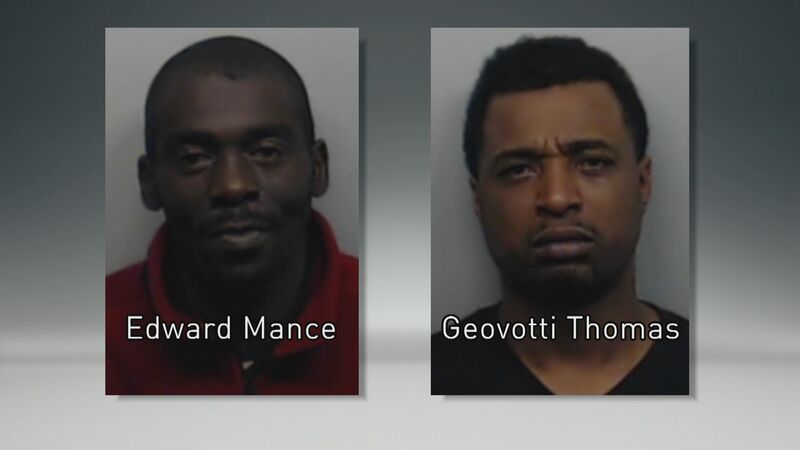 ATLANTA -- Two men were arrested after allegedly leading police on a chase and crashing Monday morning. Authorities said two men in a grey Pontiac Grand Am stole the wheels off of a car at 10th Street and Northside Drive. 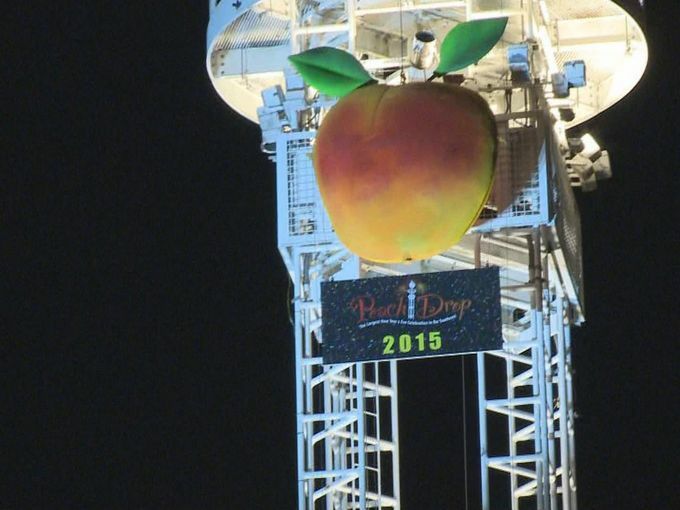 ATLANTA -- With just two weeks to go until New Year's Eve, Atlanta's mayor says the city's traditional Peach Drop will happen on schedule.